We read with interest the paper published by Repressé and colleagues . Coagulation management is a challenge during extracorporeal membrane oxygenation (ECMO) due to complex hemostatic and inflammatory responses associated with the underlying conditions that include infection, sepsis, surgery, and/or traumatic injury . Repressé and colleagues present the first algorithm-based approach to bleeding in ECMO patients. However, additional perspectives are important to consider. First, activated partial thromboplastin time or antiactivated factor × monitoring are routinely used to monitor heparin therapy in ECMO patients, despite intraindividual and inter-individual variability . Rotational thromboelastometry (ROTEM®; TEM® International GmbH, Munich, Germany) is also increasingly used in the ICU to rapidly assess the coagulation status, including clotting factors, fibrinogen levels, and whole blood clotting . Moreover, this test also facilitates fibrinolytic pathway evaluation, which cannot be easily explored by routine laboratory tests. 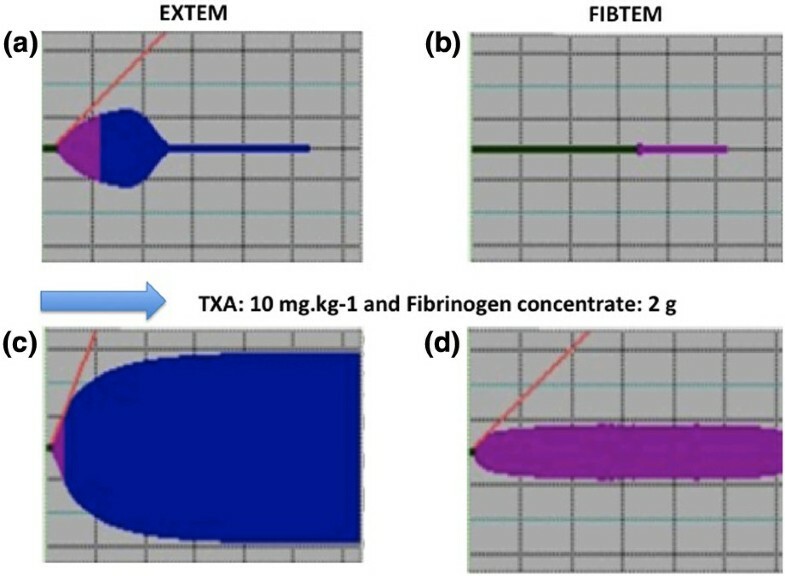 We believe ROTEM® could be used to design an algorithm-based approach to bleeding in ECMO patients and follow fibrinogen consumption associated with hyperfibrinolysis, an important cause of bleeding. For this reason, anti-fibrinolytic agents should be considered in the multimodal approach (Figure 1), an important point the authors omitted in their algorithm. Hyperfibrinolysis diagnosed in a bleeding extracorporeal membrane oxygenation patient. (a) Baseline EXTEM, (b) baseline FIBTEM, (c) EXTEM and (d) FIBTEM thromboelastometry tests after the administration of tranexamic acid (TXA; 10 mg/kg) and fibrinogen concentrates (2 g). Second, adverse events including 32% venous thrombosis and a 2.5% incidence of fatal pulmonary embolism have already been reported in ECMO patients . In another series, Combes and colleagues reported a 10% incidence of femoral vein and 7% incidence vena cava thrombosis . Recombinant activated factor VII is associated with thromboembolic events  and should be used with caution until additional data help us evaluate the benefit-to-risk administration in bleeding ECMO patients.